Today I’m feeling both happy and sad. 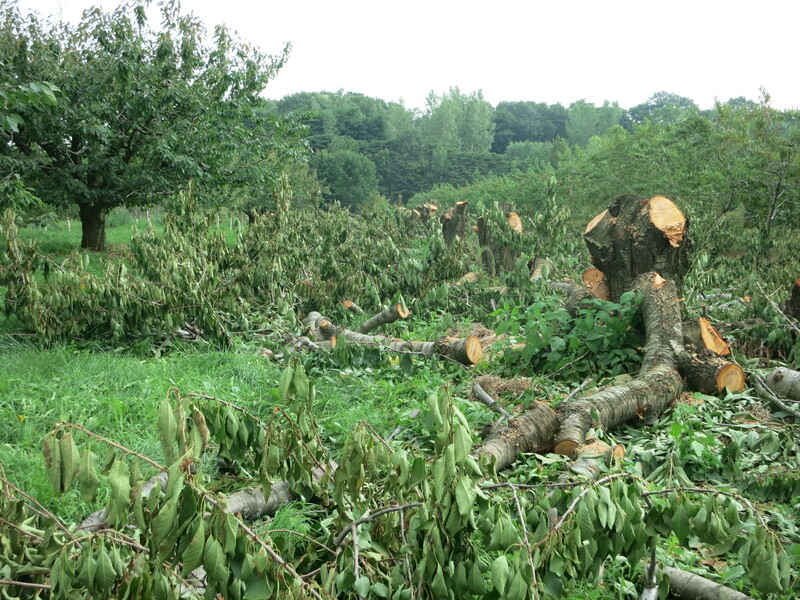 Today I began to cut down our sweet cherry trees – all of them! We talk about it every year, but this time we are really doing it. 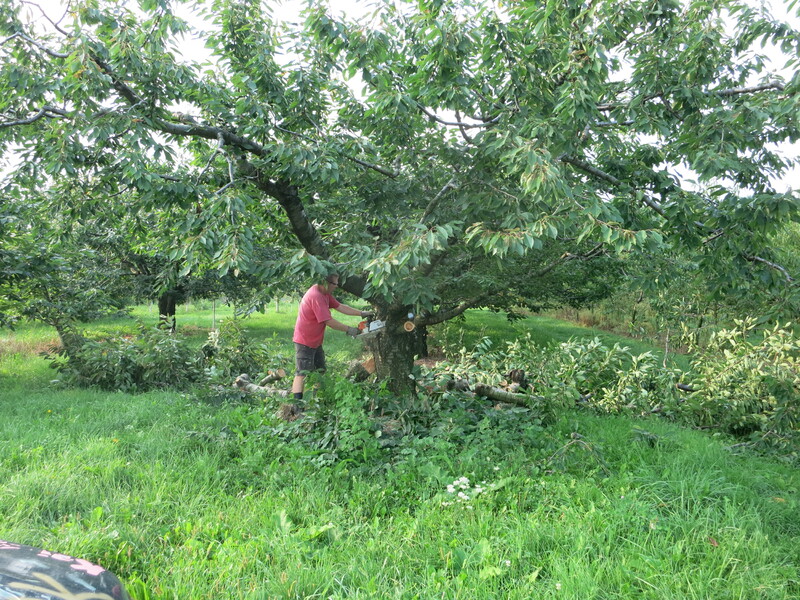 All our cherry trees are coming down (except for the few trees in front of the barn – the ones that provide a screen between us & the road). But certainly all the rest of the cherry trees are going to be history. It’s sad because they do have a lot of history. Most were planted by my father years ago. Many of them are older than me. I know each tree because I’m the one who has pruned them each spring for more than 30 years. I picked the cherries on these trees when I was a boy. I know which trees ripen their cherries first, which ones always have a heavy crop & where the sweetest fruit can be found. 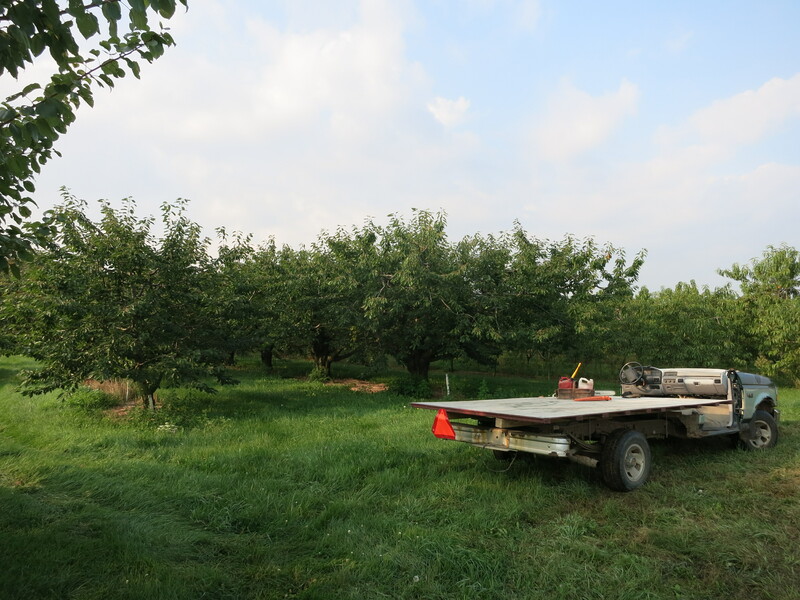 I know where to duck my head when driving through the orchard to avoid the low branches – without even looking ..
I’m happy, very happy because we won’t have the stress of cherry season anymore. “Expect a good crop 1 out of 5 years” is what the old-timers used to say. I say that’s pretty optimistic. 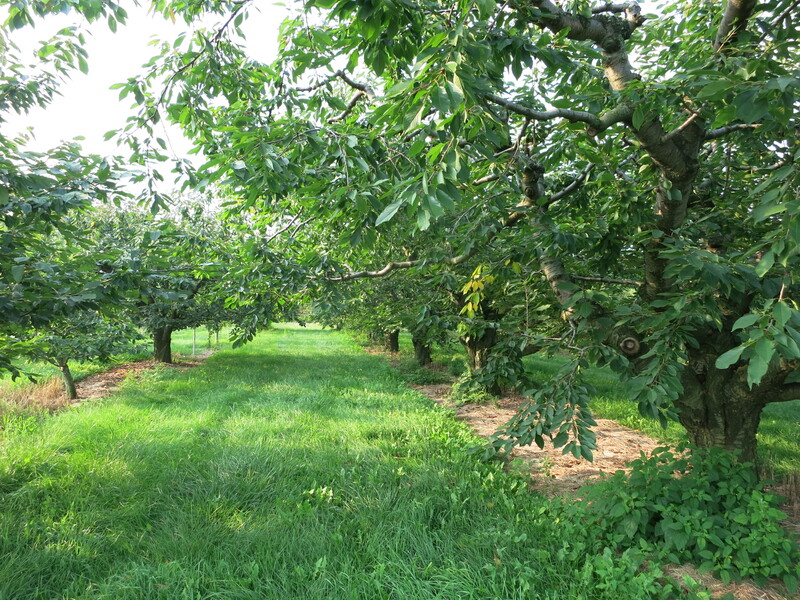 It seems that almost every year either the crop is poor, or we get rain at the wrong time & the cherries crack & rot, or the market is slow, or prices are low, or we can’t find people to pick … No, we definitely won’t miss cherry season & all it entails. I will miss eating cherries ripe off the tree though! Anyone need some good firewood? Garlic, shallots, kale, tomatoes, sweet peppers, peaches. 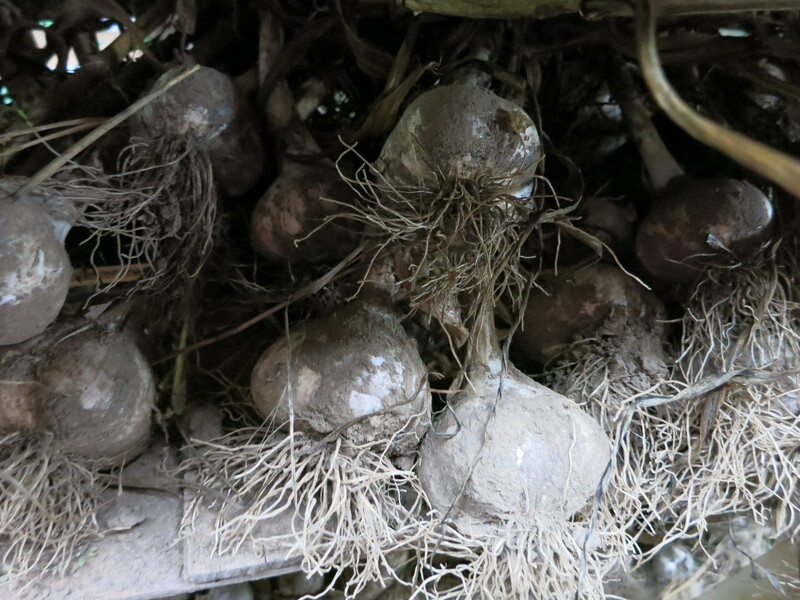 The first of the garlic is finally dry & ready – and it tastes great! This is the first time we have grown shallots & we’re a bit surprised by their large size and beautiful colour. Good Housekeeping says that shallots are similar to an onion, “their flavor is richer, sweeter, yet more potent. 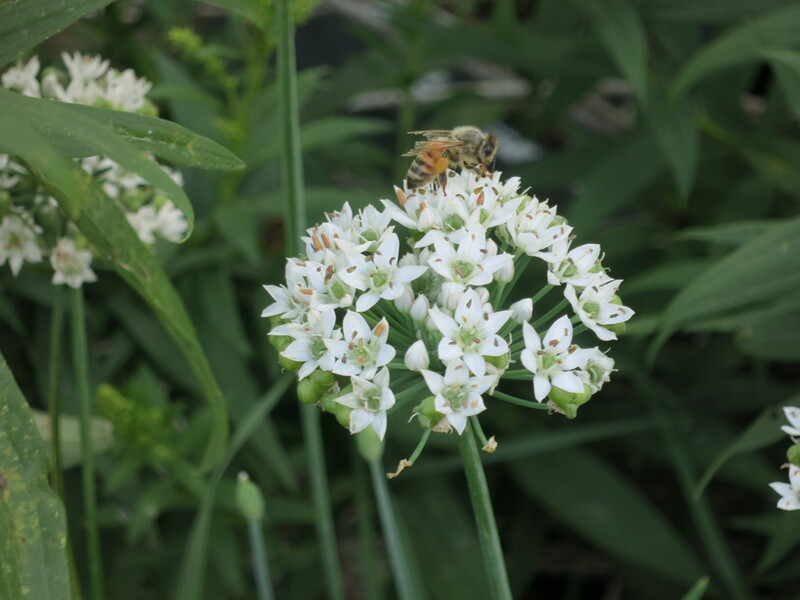 Like garlic, they grow in clusters, with several bulbs attached at the base. You’ll recognize them by their coppery skins and their off-white flesh, which is usually tinged with magenta. Shallots add a great depth of flavor to pan sautés, soups, sauces, and stews, and pair especially well with chicken and fish. To substitute one for the other in recipes, use half the amount of shallot that you would onion”. Try our shallots & let us know how you like them. 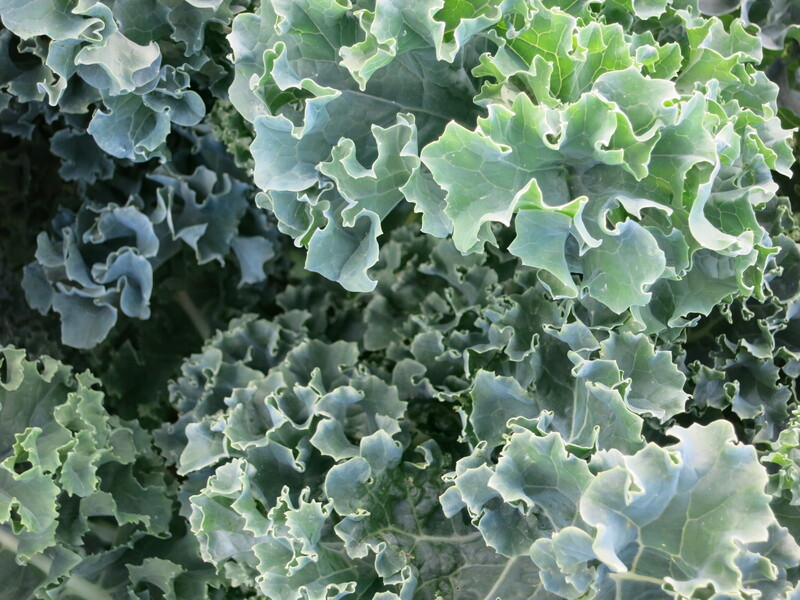 Your green this week is kale. Enjoy it raw in a salad, sautéed with your shallot, or blended in your morning smoothie. 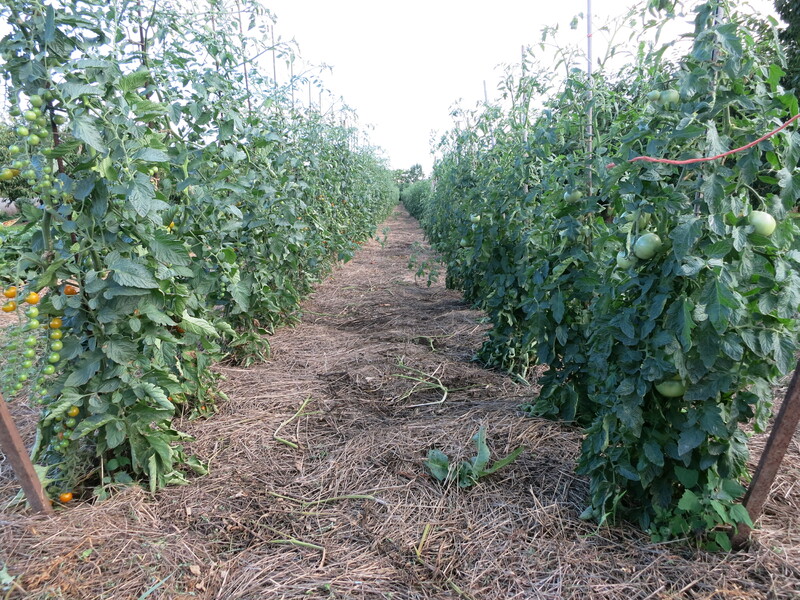 Tomatoes continue – in abundance. Our go-to lunch these days includes tomatoes, onion, eggplant & garlic sauteed together & eaten on toast – quick, easy & delicious! Enjoy the different colours, & sizes & shapes in your box this week! There will be another sweet pepper in your share. But the plants are hanging full of peppers & sooner or later there will be more. Peaches! 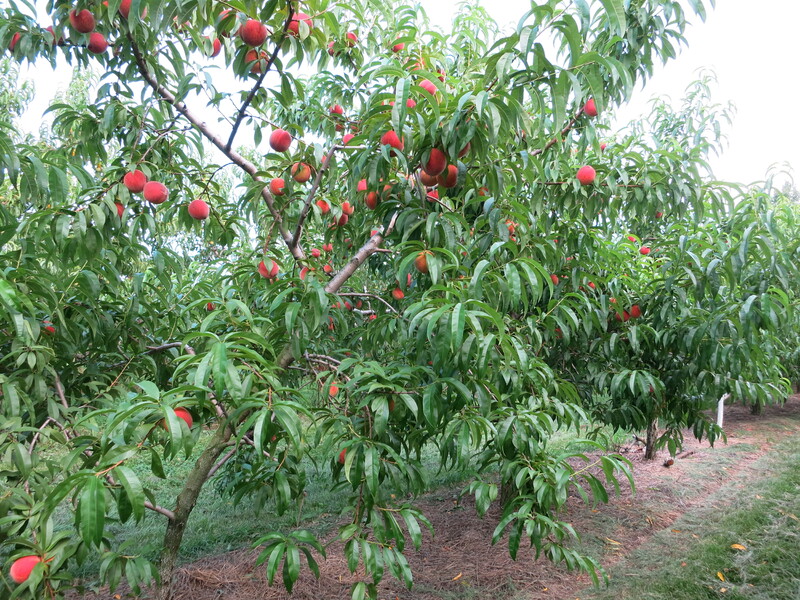 The season is winding down & we only have a few varieties of peaches left to harvest. This may be the final week that peaches are part of your CSA. For anyone thinking of purchasing extra peaches to can or freeze – this is the week to do it! 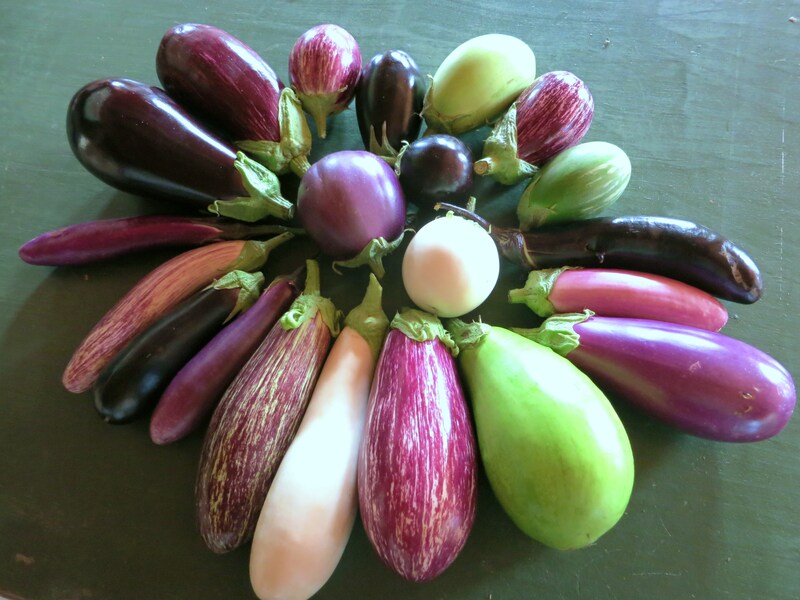 extras – more eggplant along with hot peppers. We are growing about 25 kinds of hot peppers this season. The first of them are ready & will be available for those who want them. They will be the milder Hungarian hot wax peppers and jalapenos. The hotter varieties won’t be ripe for a few weeks yet. 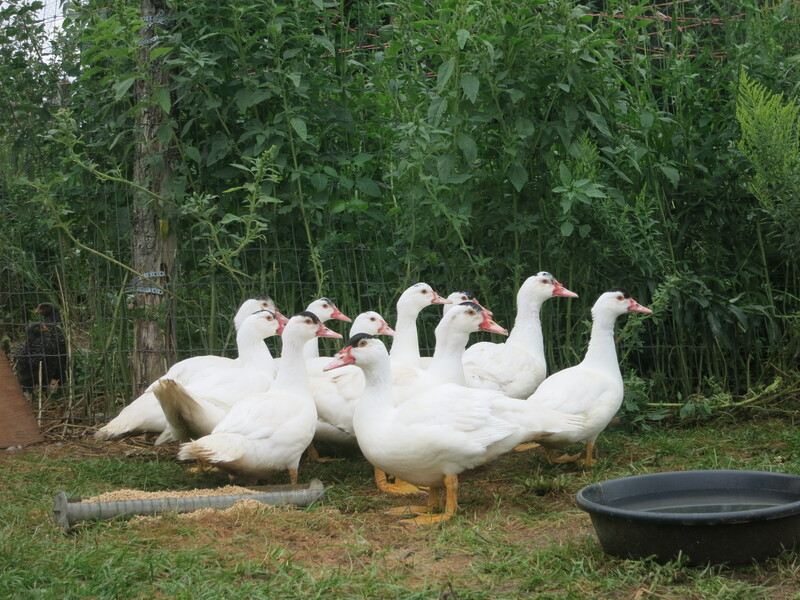 This week our ducks found their wings & are enjoying the wonders of flight. 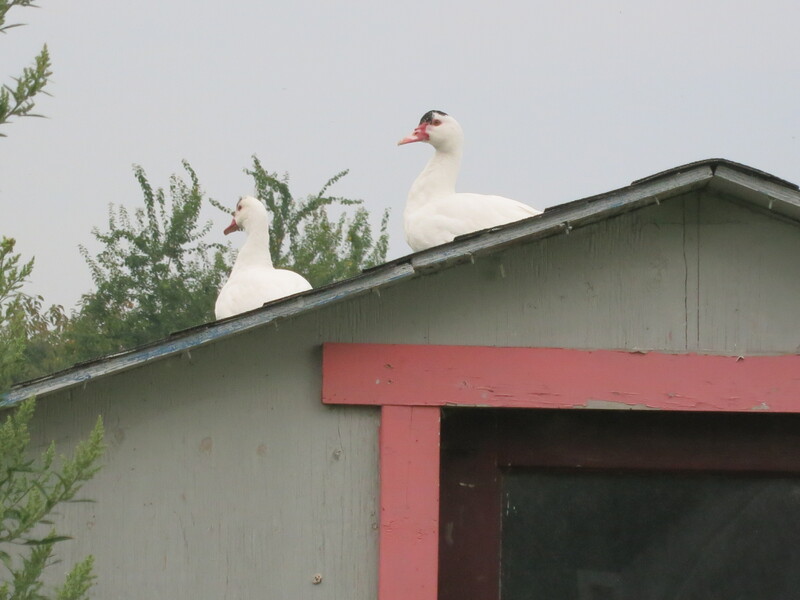 They like to see things from a higher vantage point! It’s the same every year. 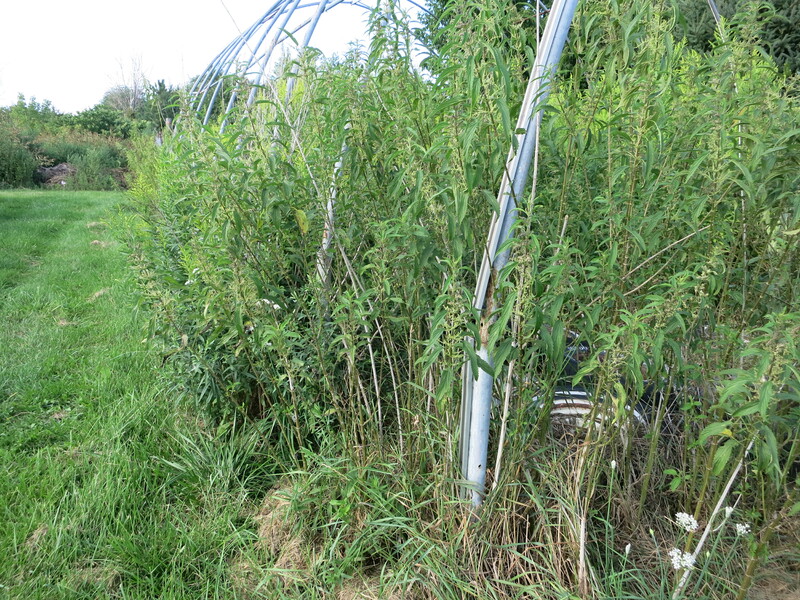 And every year I mutter & whine about it – how messy & disheveled the farm looks at this point in the season. Harvest is a busy time and always take priority over other work, especially farm maintenance and just making things look nice. 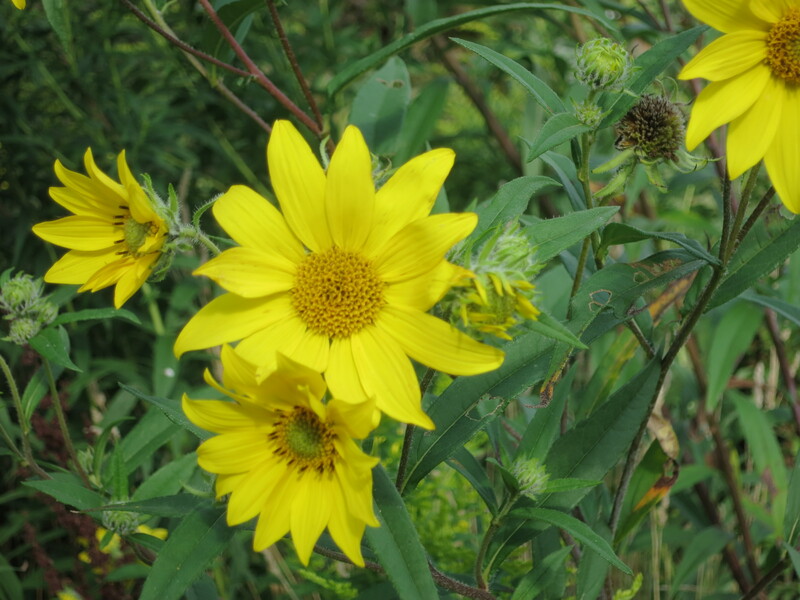 So the weeds grow, the wild areas become a little wilder and we pretend we don’t see it. Or rather, we try to look beyond the mess & find beauty anyways – ignoring the big picture & focusing in on the details. 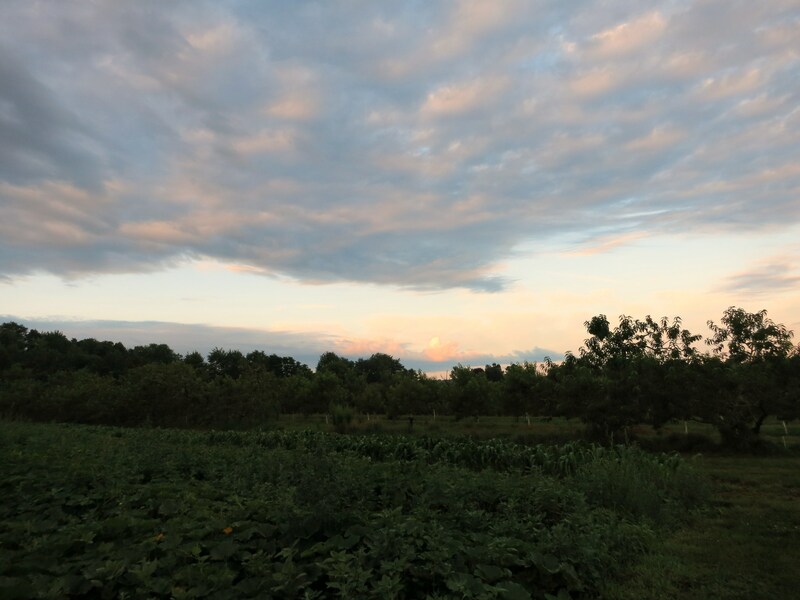 In the peach orchard there are now more empty trees, than trees with fruit. 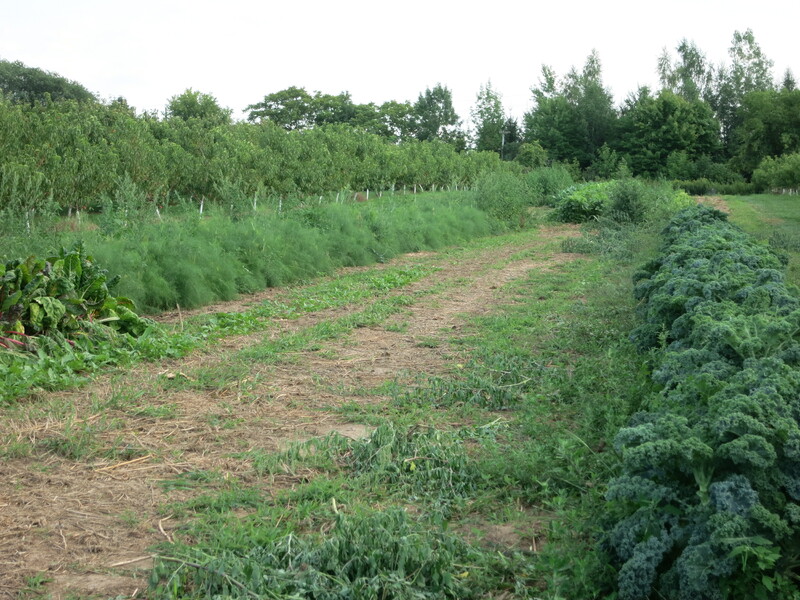 Many of the vegetable fields are mowed down or worked up and ready for a cover crop to be planted, with only a row here & there of vegetables waiting to be harvested. But there is beauty here too! 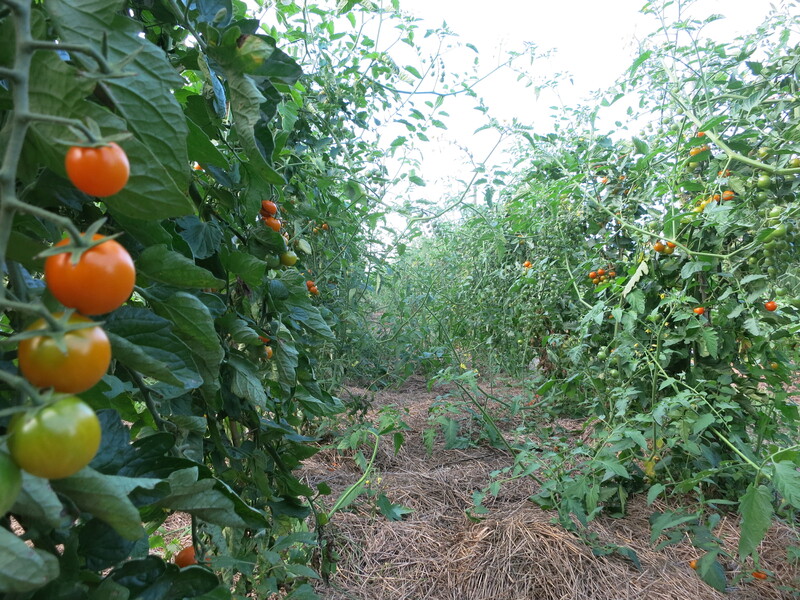 The tomato patch has become a jungle – a jungle producing an abundance of amazing fruit! The cabbage is forming nice, firm heads. 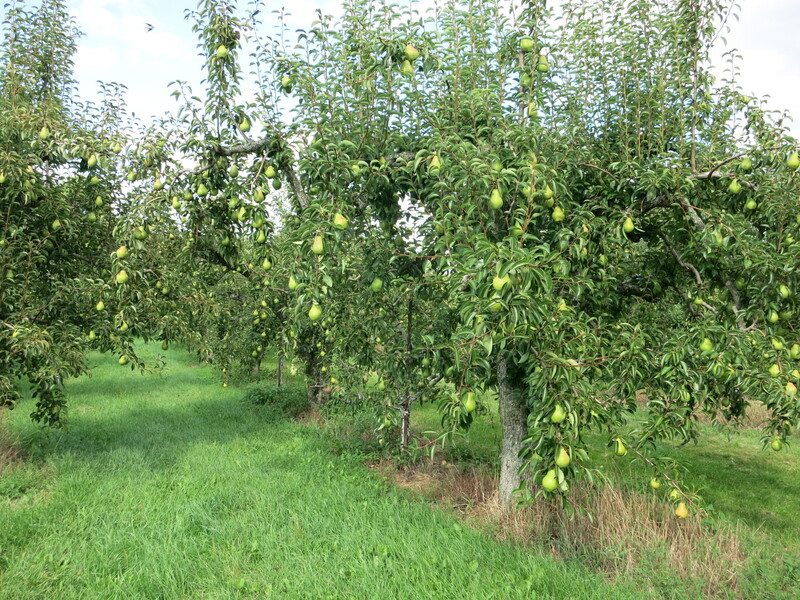 And the Bartlett pears are making their final growth spurt before harvest. 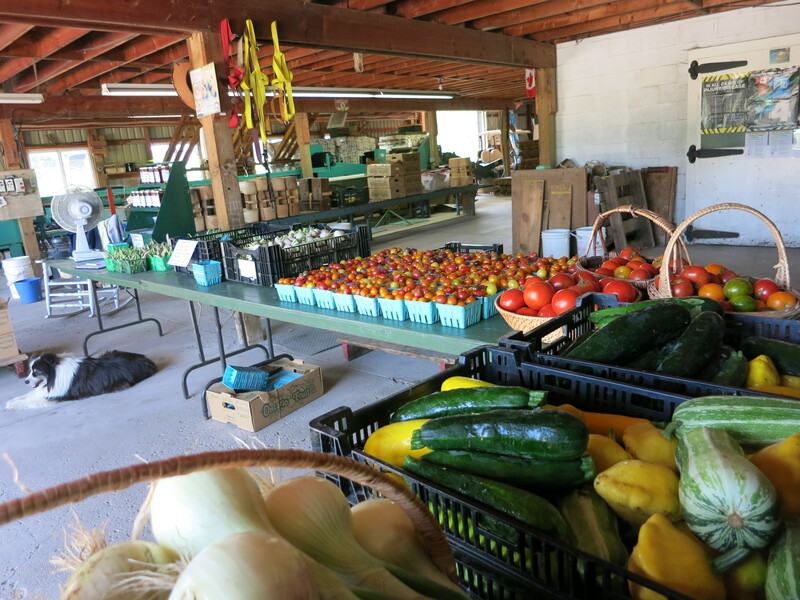 Cabbage, sweet peppers, tomatoes, collards, pears, peaches. Extras – white peaches, eggplant. 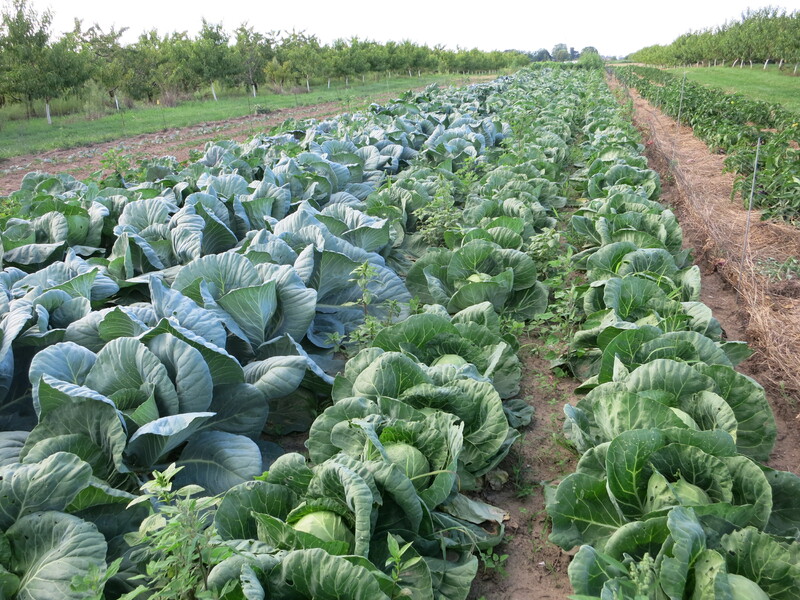 The first of the cabbage is in your box this week – a mini head called Tiara. The seed catalogue describes it as a lettuce-like cabbage called “lettage” – good tasting, tender, crisp & juicy, excellent for coleslaw or salads. We’ll see if it is an accurate description. 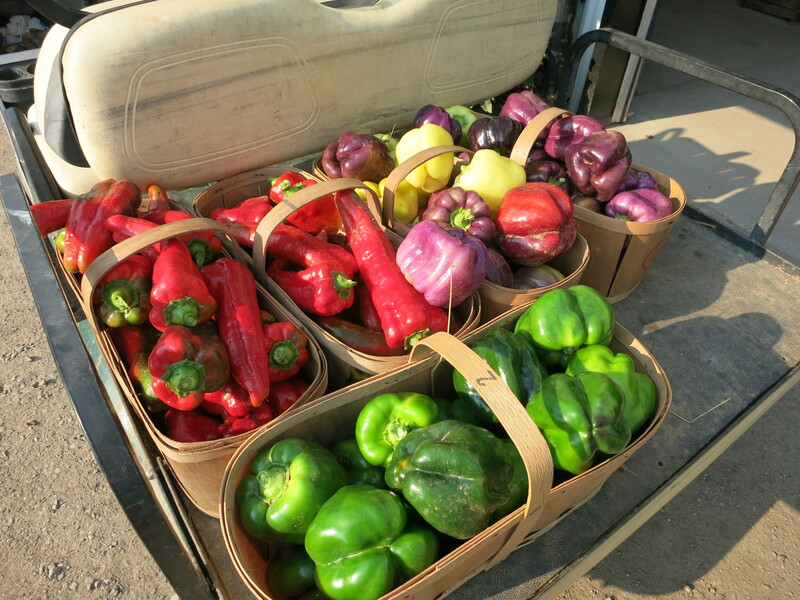 Sweet peppers are in short supply – thanks to the mice that keep nibbling on them as they ripen! But there will be at least 1 for every share. Tomatoes on the other hand are plentiful! The possibilities are endless – tomato sandwiches, roasted tomatoes, tomato soup, tomato salad … Our favourite tomato salad includes lots of chopped up tomatoes, some onion, a drizzle of vinegar, a sprinkling of sugar, and lots of dill. Another bunch of collards is part of this week’s share. We have included a recipe below for collard greens with pears. 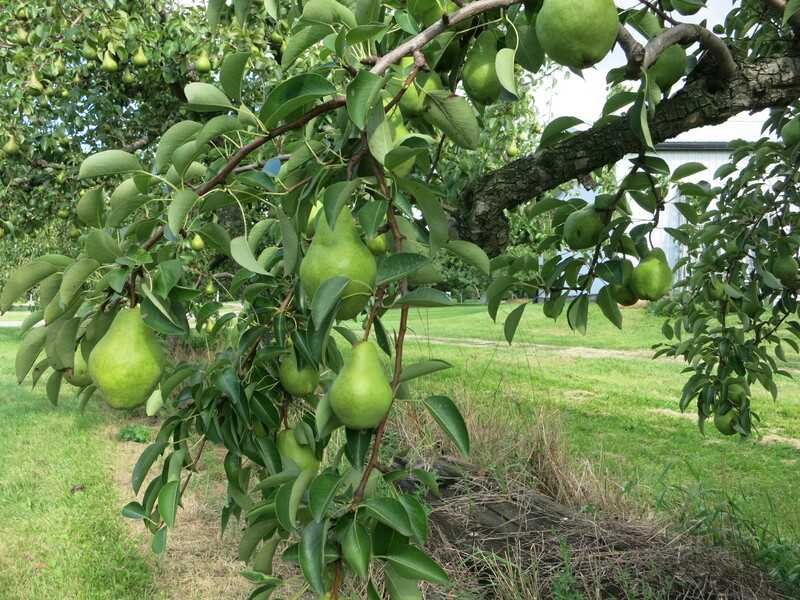 This week’s pears are called Harrow Delight. Similar to the pears in last week’s box, they are sweet & tasty now – don’t wait for them to turn yellow & get soft. They are best eaten while still firm. White flesh peaches might be new to some of you. Like the name suggests, they are white inside, instead of yellow. They have almost a floral fragrance, and are very sweet & juicy. 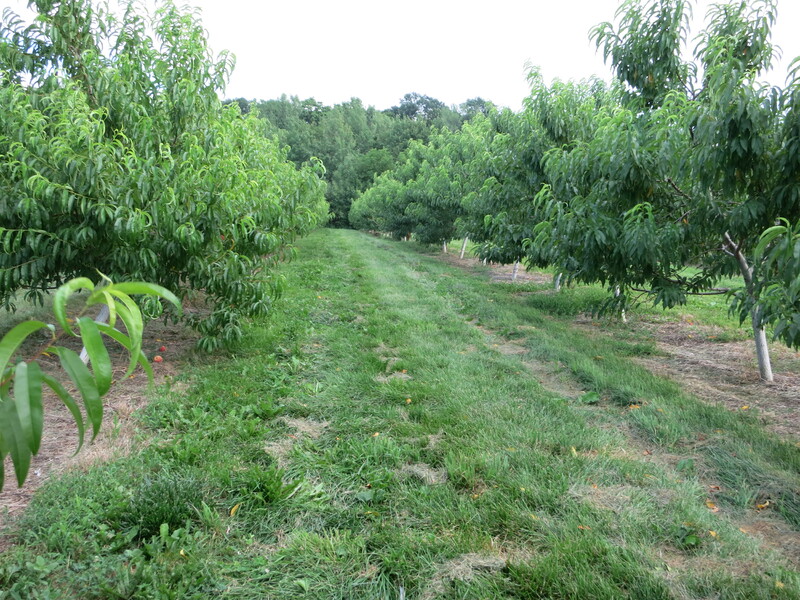 We will have some #2 grade white peaches ready for you to try. An assortment of eggplant will also be available. *** We are pleased to offer extra fruit or vegetables for our shareholders when available. However we ask that you only take enough for your own family’s use – not for other relatives or friends. In a medium bowl, gently toss the pear with the spiced butter mixture and 1/4 tsp salt. Arrange the pear slices in a single layer in a 12″ skillet and sprinkle the shallots in the spaces between. Cook undisturbed over medium-low heat until the pears are golden on one side, 3-5 minutes. Gently turn over the pears and stir the shallots. Cook until golden brown, 3-5 minutes. Gently transfer pears to plate, leaving the shallots in the pan. Add 1/3 cup water to the pan and stir, scraping the bottom of the pan. Transfer the shallots and any liquid to a small bowl. Heat the oil in skillet over medium heat and add half of the green, quickly stirring and turning with tongs. Once the greens have just started wilting, add the remaining greens. Pour the shallots and liquid over the greens. Reduce the heat to a gentle simmer and cover with a tight lid. Braise until the collards are tender, about 5 min. Season to taste with salt and pepper and stir in the pears. 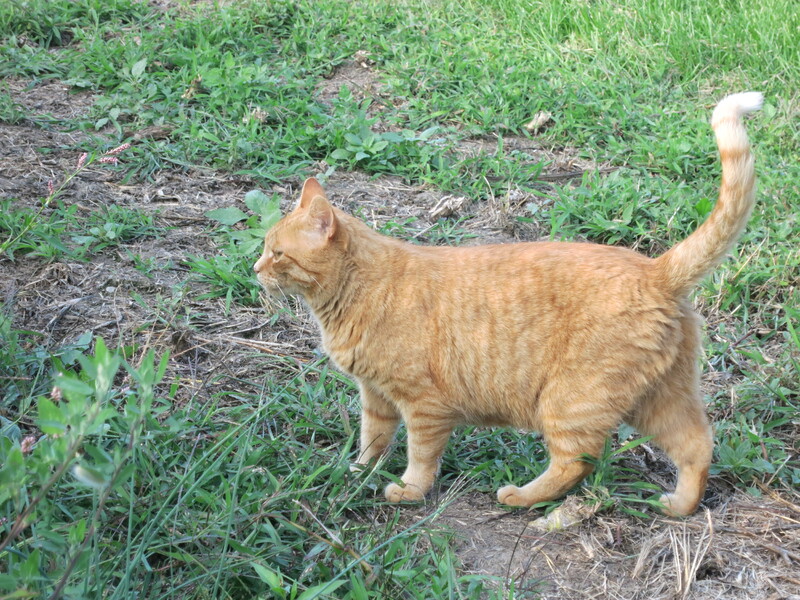 Oliver out to save the crops from marauding mice! 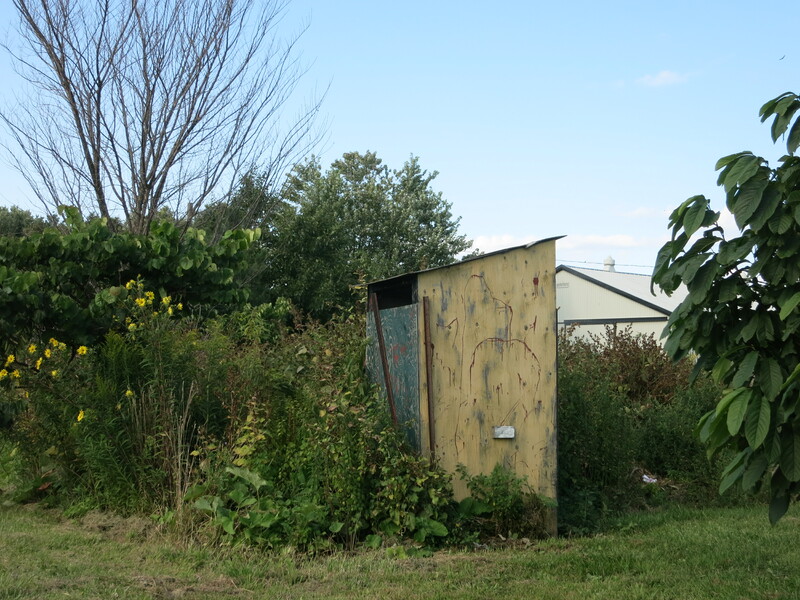 Wasn’t it just a few weeks ago that our CSA boxes were green – just green – and shareholders were wondering when something besides green would appear? Things have been much more colourful lately & this week is no exception. 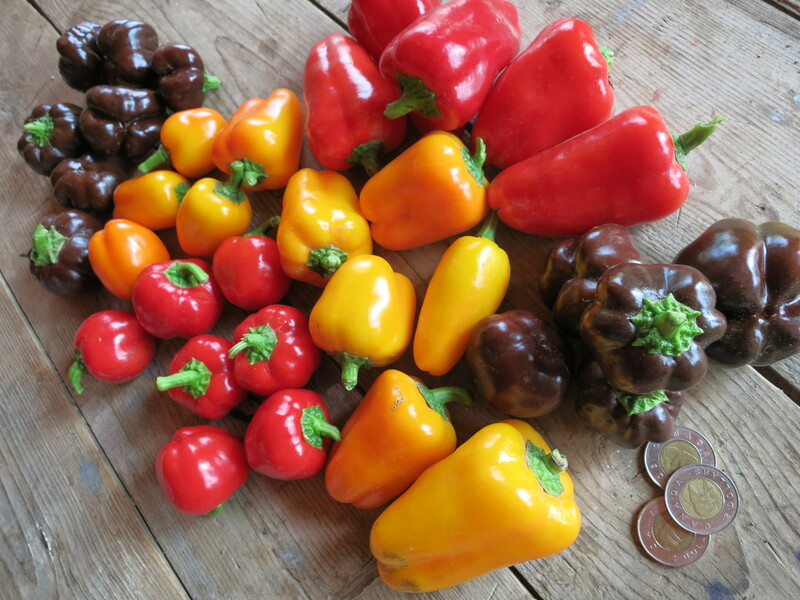 There is colour bursting from every fruit & vegetable that we are harvesting now – colour & flavour! Peppers, tomatoes, beans, onions, eggplant, peaches, pears. 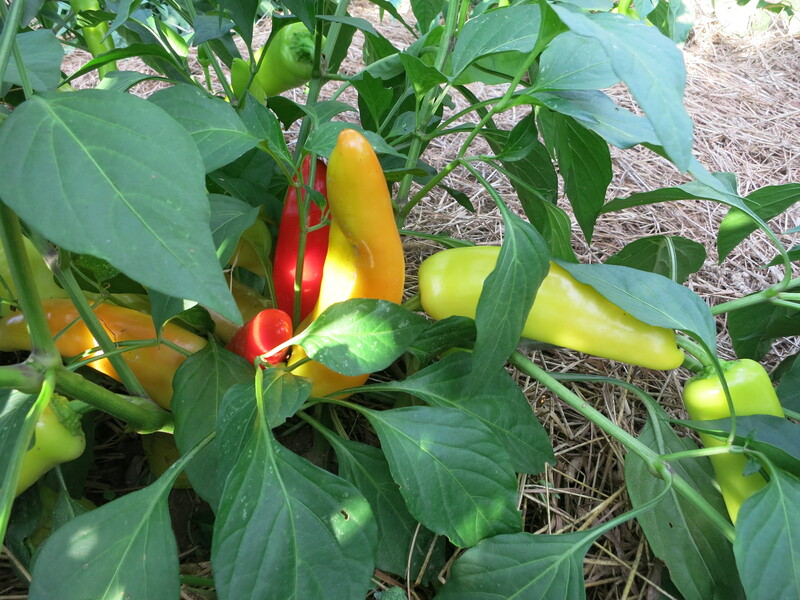 Our sweet peppers are beginning to be ready for harvesting, so there will just be a single pepper in your box this week. Hopefully the numbers will increase. Tomatoes have certainly increased. 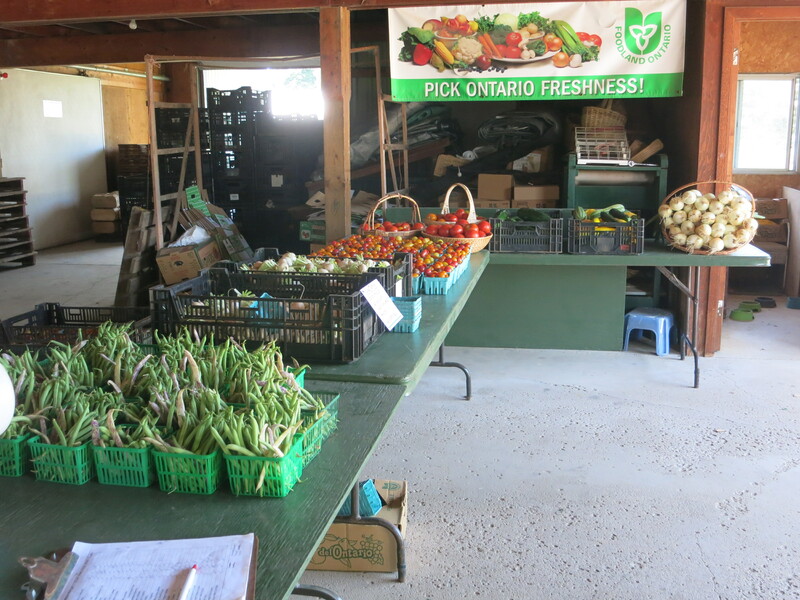 The weekend warmth meant a very large pick today – field tomatoes, heirlooms of every size & colour, and lots of cherries too. This is the week to feast on tomatoes! 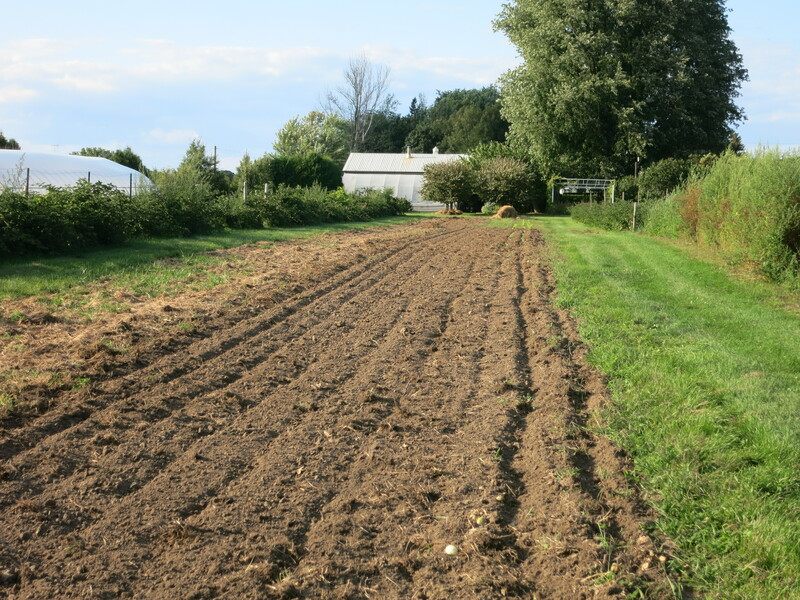 The beans are slowing down but you will find some beans included in your share again – onions too! 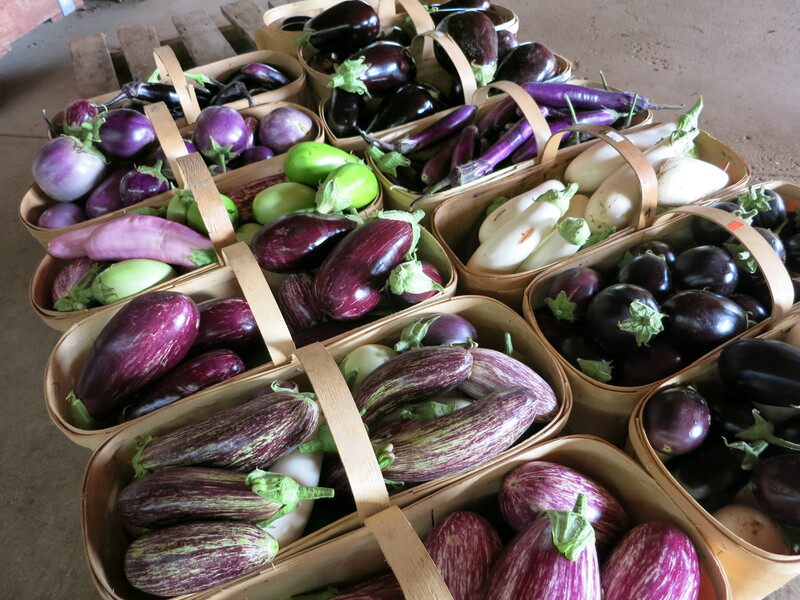 The pictures above show the vast array of eggplant that we are growing this season. Eggplant will be available for those who want it. 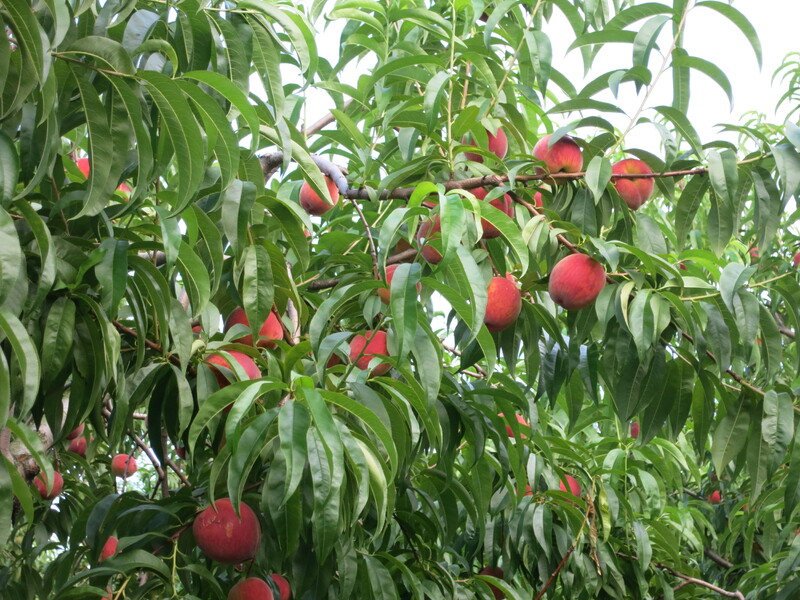 Peaches are plentiful, colourful & flavourful! Enjoy them because the season is short. Another few weeks & they will be gone! 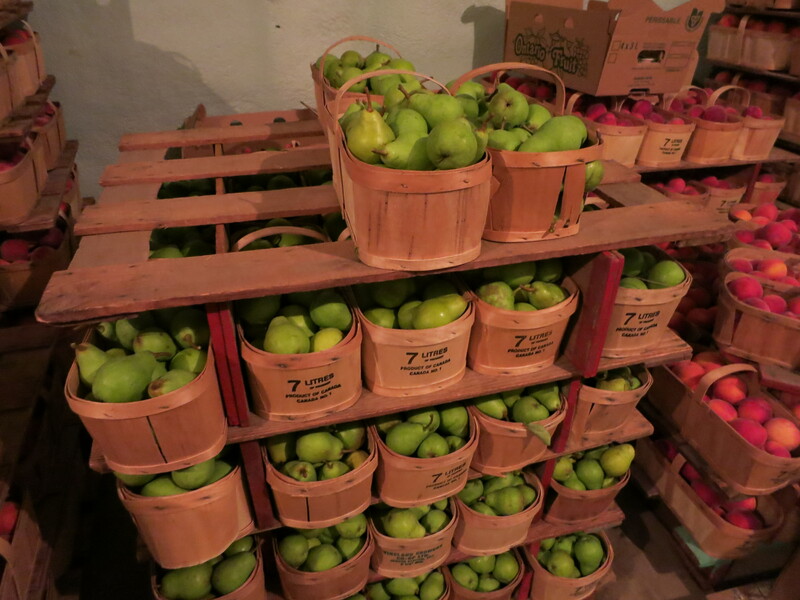 The first pears of the season are part of your share this week. Harvest Queen is their regal name, a rather grand name for such a small pear. They are already sweet & delicious even though green. Eat them now while they are still a bit crunchy. There is sadness on our farm today. 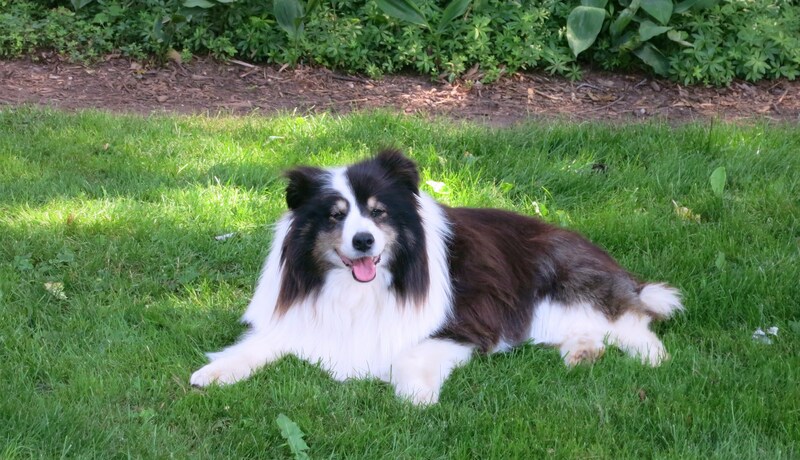 We said good bye to our Meesha this afternoon. She took ill on the weekend & it became apparent that she would not recover & return to health. Amy got her as a puppy and we all have enjoyed her for almost 13 years. Meesha was always smiling & happy to be with us! 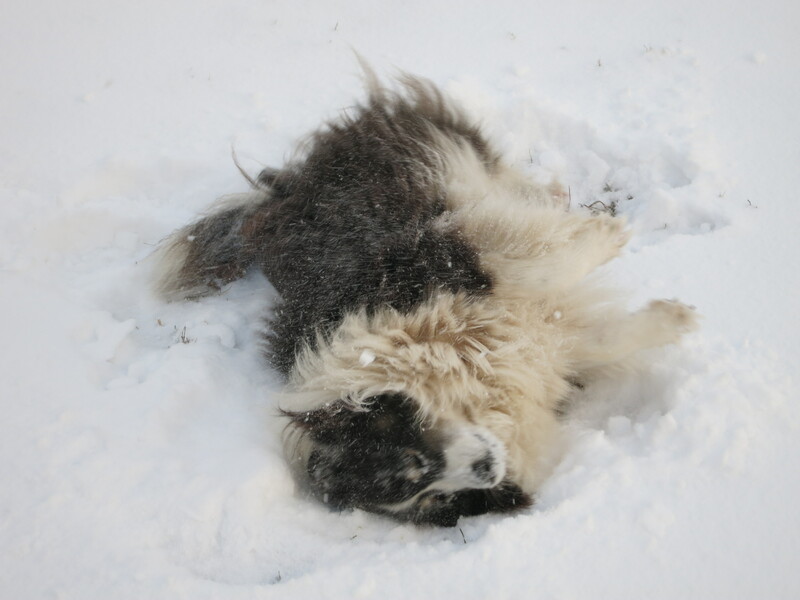 She always found joy in the cold & snow! 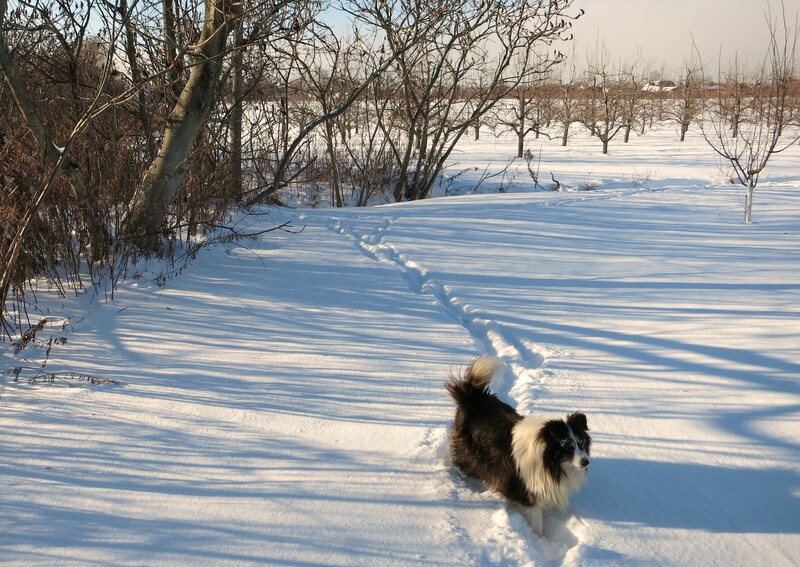 I especially enjoyed our daily walk around the farm. We will miss you Meesha! … purple plums. These are Damsons, a small, tart plum usually used for jam & baking. 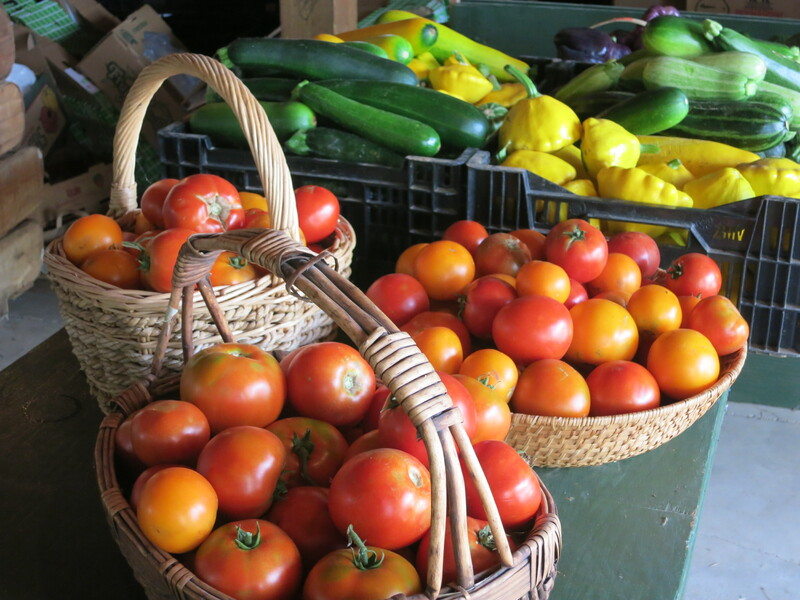 Many customers at our farmers’ markets are eagerly waiting for these. They should be ripe in a week or 2. 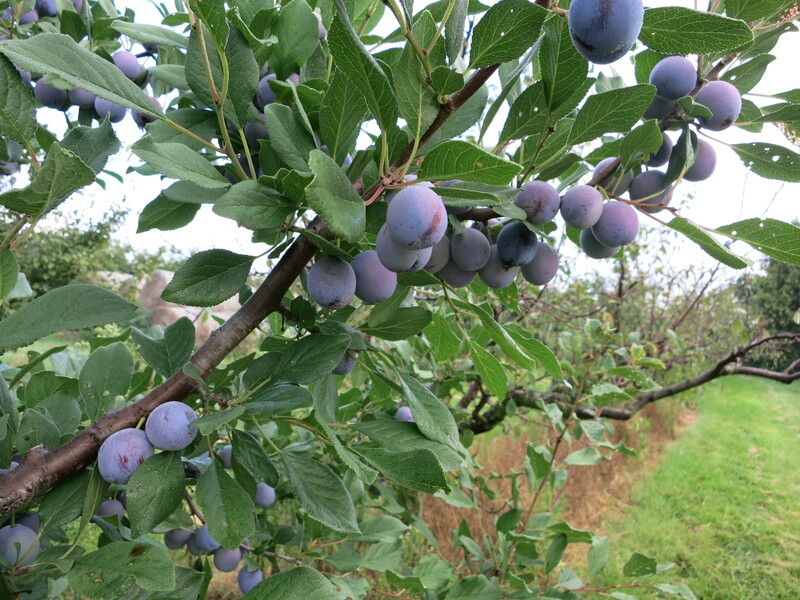 While these Damsons have a good crop, most other plum varieties have none. 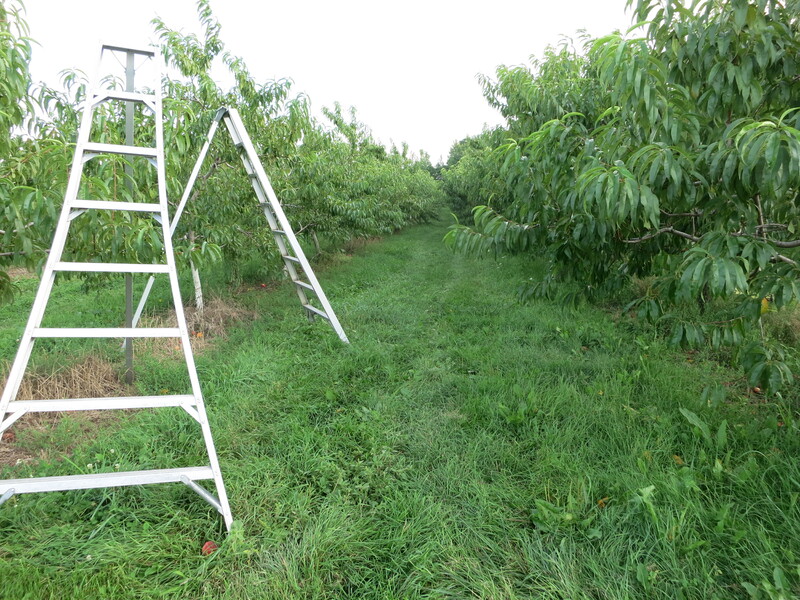 Our row of early blue plums yielded a grand total of 3 baskets instead of the usual 100+. 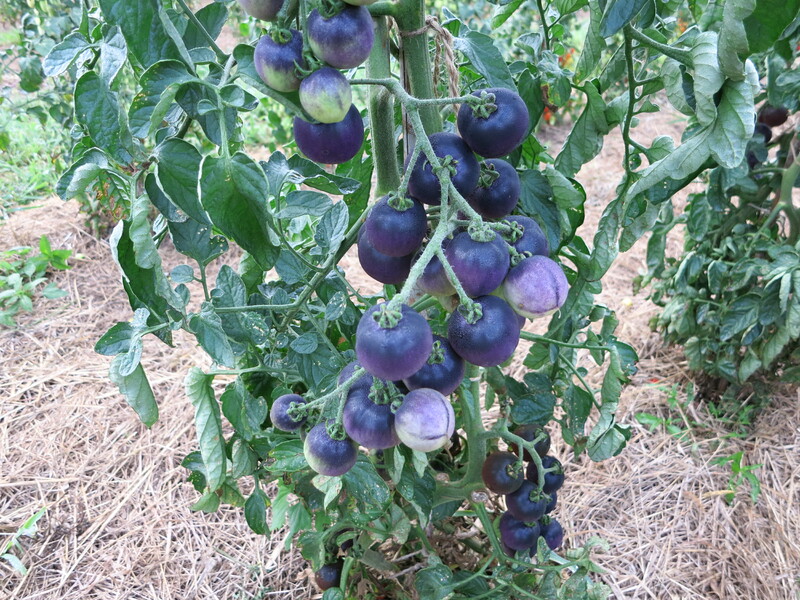 Only the Italian prunes seem to have a reasonable crop – they will be harvested in September. 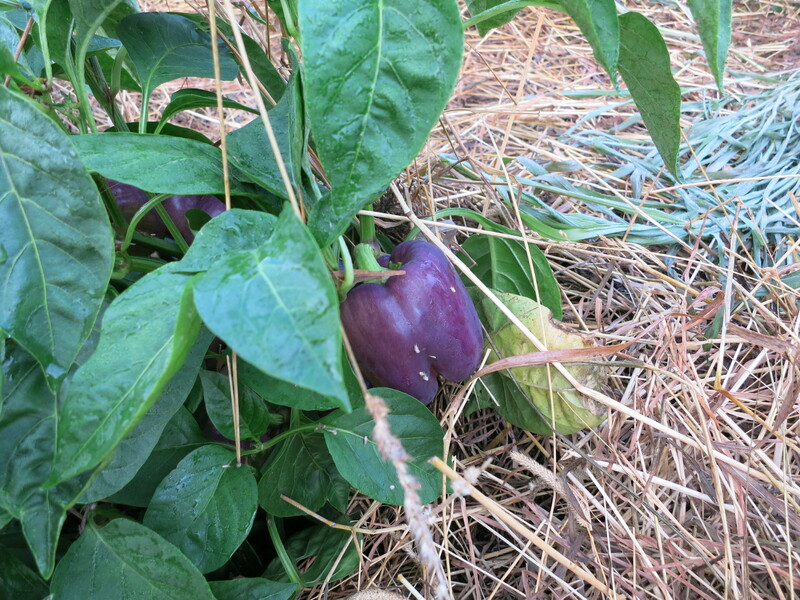 … purple peppers – almost ready! 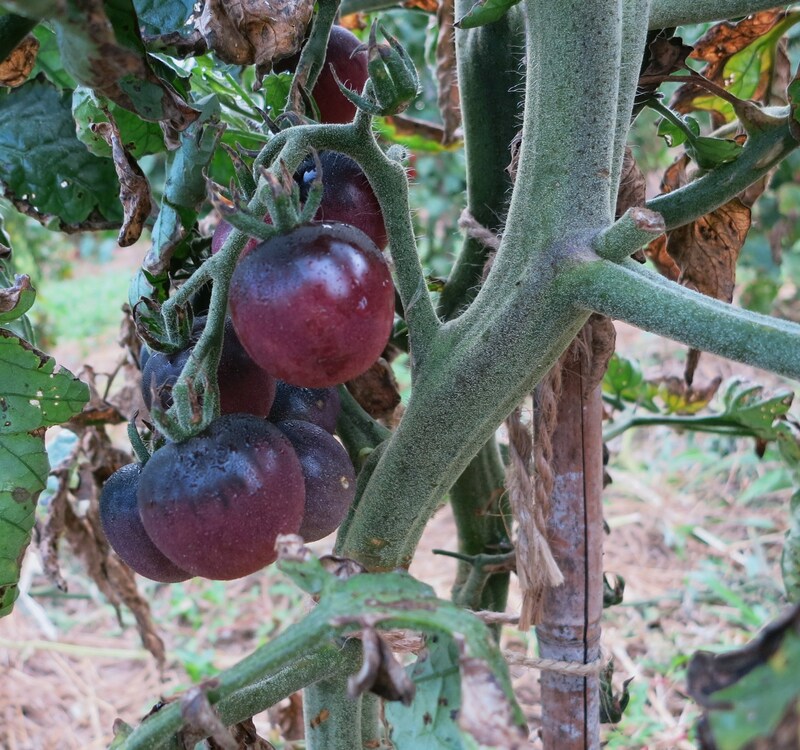 … purple cherry tomatoes. 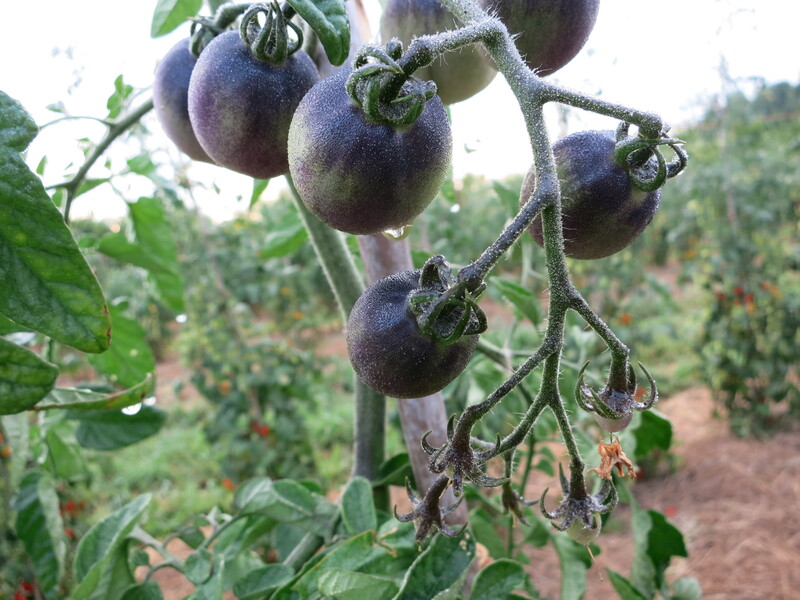 We grow many kinds of purple tomatoes in all sizes – they not only look good, but taste good too! 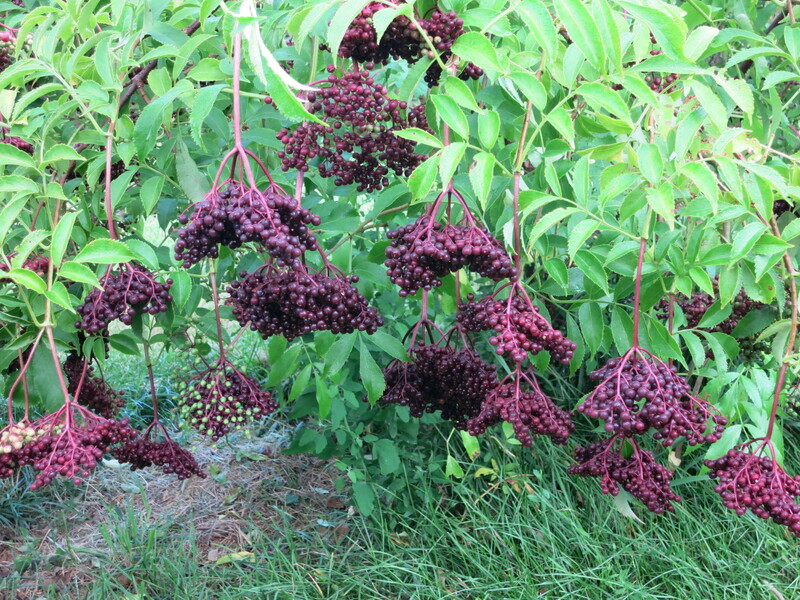 … purple elderberries. 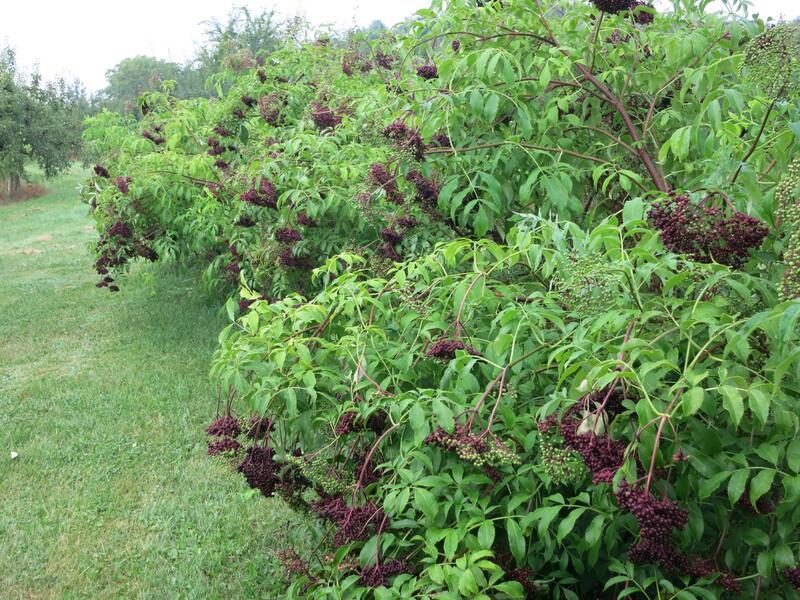 Last year we planted some elderberry bushes & they are loaded (and almost ripe). We’ll see who gets them first – us or the birds? 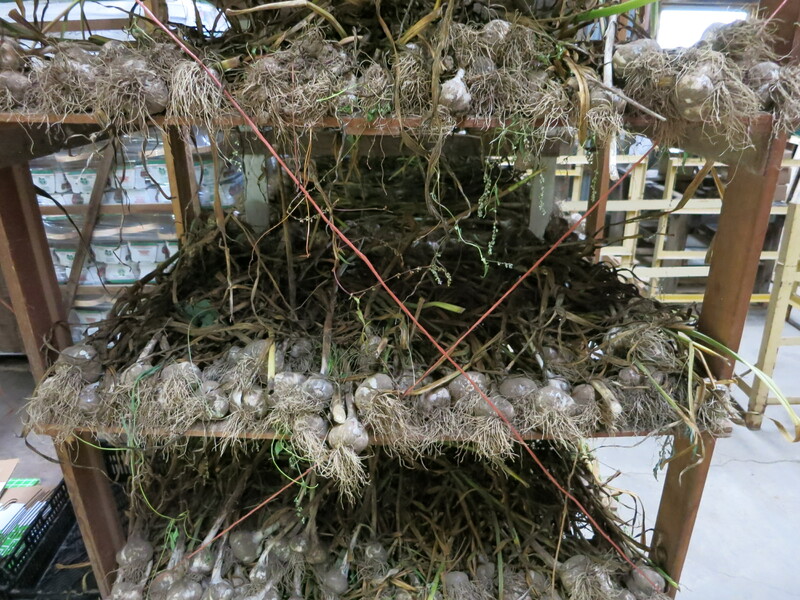 Our garlic is not purple (some varieties are), but it’s all harvested now & drying on racks in the barn. Once it’s dry (in a few weeks), it will be showing up in your CSA boxes. Lettuce, collards, beets, tomatoes, onions, peaches. We snuck in a late spring planting of lettuce & it’s ready now. The more moderate temperatures lately means it tastes great (hot, humid weather like we experienced the other week makes lettuce bitter). This is our 2nd year growing collards – probably one of my favourite greens. Collards are a nutritional goldmine, similar to kale & broccoli. They are low in calories, high in fibre, & rich in beta-carotene, vitamin C, calcium & B vitamins. They are rarely eaten raw, but are best prepared by boiling rapidly for 5-10 minutes which preserves nutrients, colour & taste. Then the collards are drained, dried & sautéed in a little oil with other vegetables or herbs & flavourings. Sauteing collards without boiling first is another cooking method. It results in slightly stronger flavoured greens with a chewier texture. We have included a simple collard recipe below. Beets make another appearance in your box this week. They may be orange or red beets or a combination. Finally the large tomatoes are ripening (we enjoyed our first tomato sandwich today at lunch). 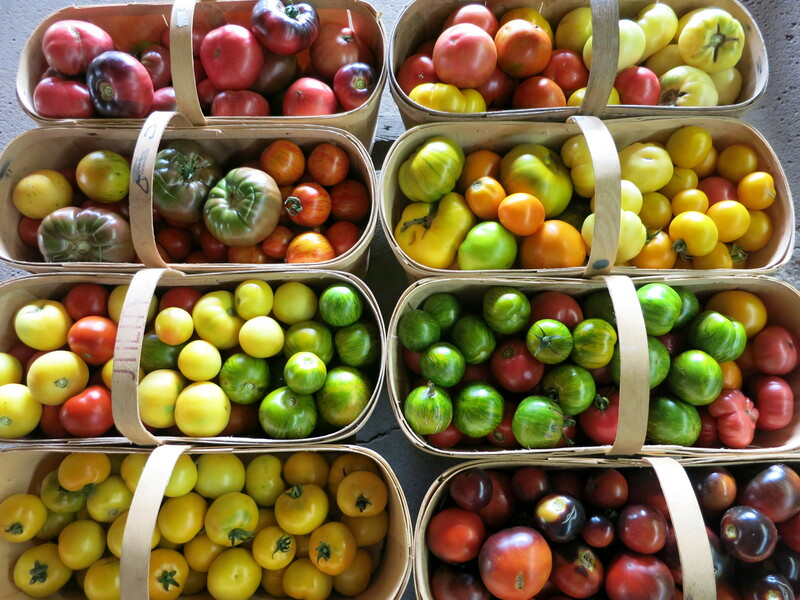 There should be a few in your box along with lots of smaller cherry tomatoes. 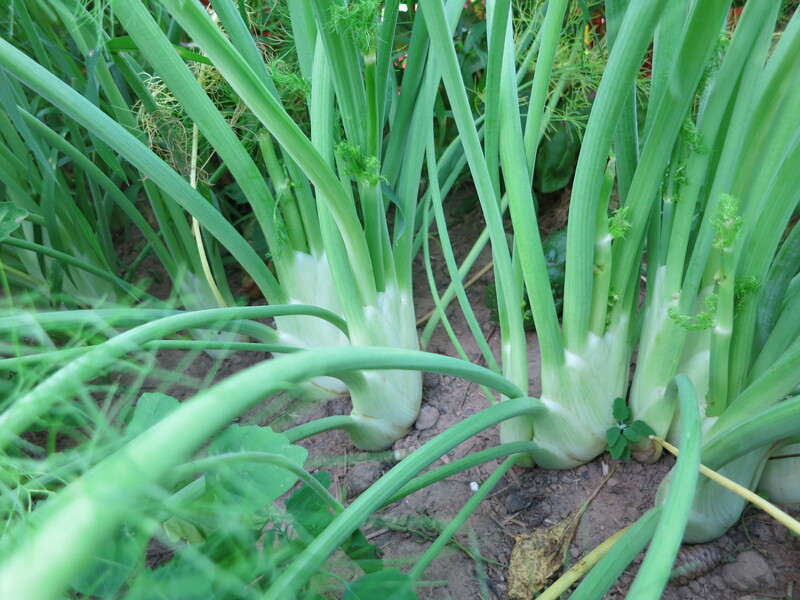 Yes, we’re behind with our weeding (as usual) so the onions are not as big as we would prefer, due to competition from all the weeds – but the flavour is great! Peaches continue to be the favourite item in the CSA boxes lately. Enjoy them again this week! Remember to store them in the fridge & bring them out about 1 day before you want to eat them. This gives them time to warm up & soften. There will be eggplant available for those who want it. Remove and discard stems and center ribs of collard greens. Cut leaves into 1-inch pieces. In a kettle of boiling water cook collards 5-10 minutes – until tender, but still bright green – and drain in a colander. Mince garlic. In a heavy skillet heat butter and oil over moderately high heat until foam subsides and stir in garlic, collards, and salt and pepper to taste. Sauté collard mixture, stirring, until heated through, about 5 minutes. Drizzle collards with lemon juice and toss well. An option is to substitute carmelized onion (from your CSA box) for the garlic. 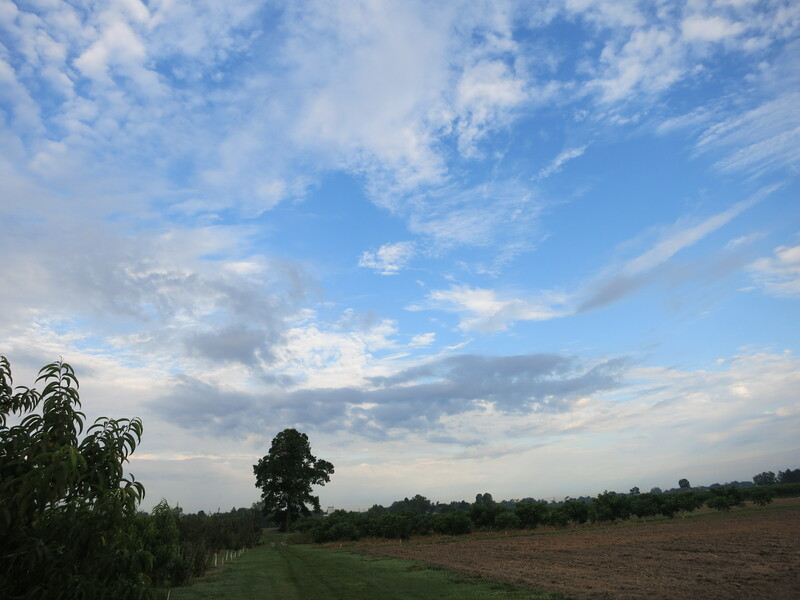 Without the high humidity this week, the skies over the farm have been beautiful! 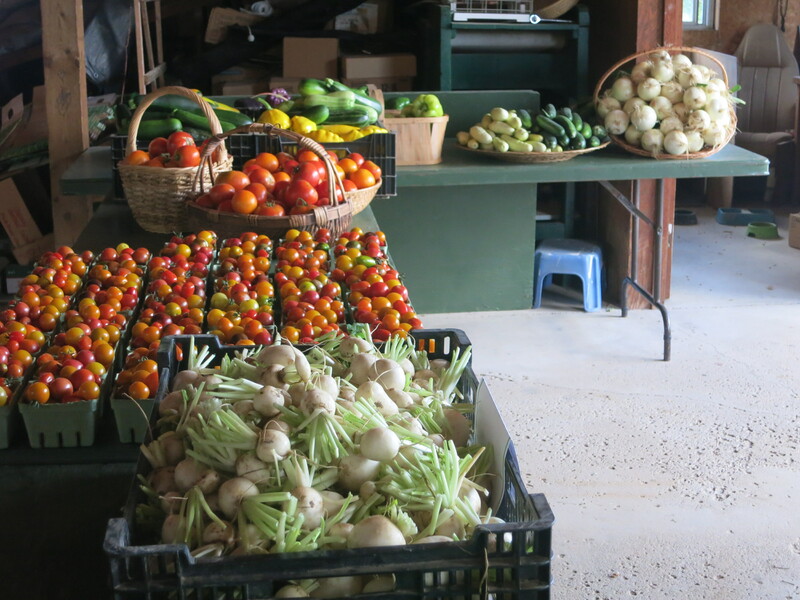 This week marks the halfway point of this year’s CSA already! Everyone seemed very excited for the peaches last week! We hope you enjoyed them! 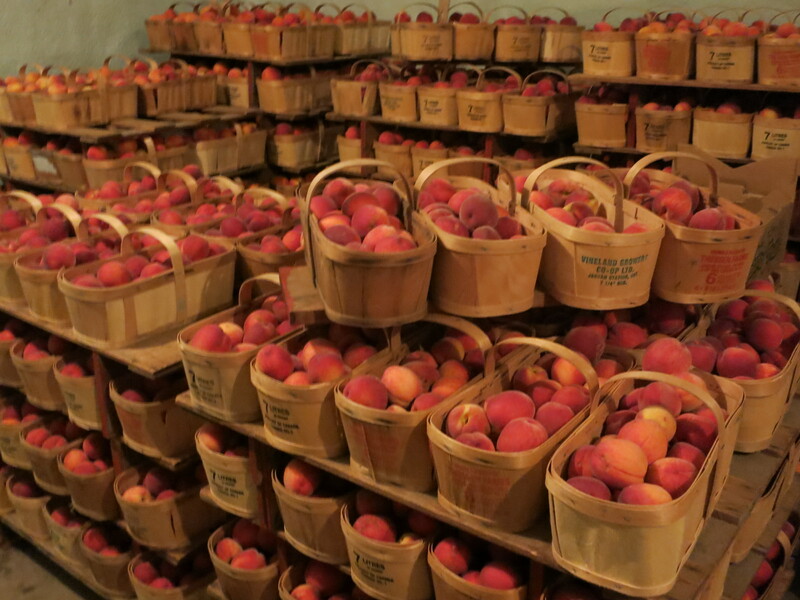 Rest assured, there will be peaches in your share again this week, and we hope for many weeks to come. 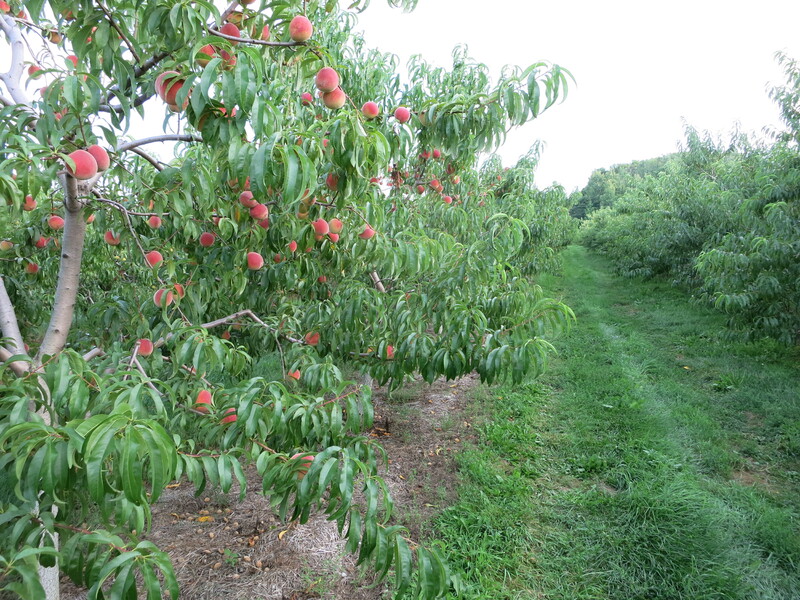 The peaches we are picking now are all beautiful, colourful & deliciously juicy & sweet. 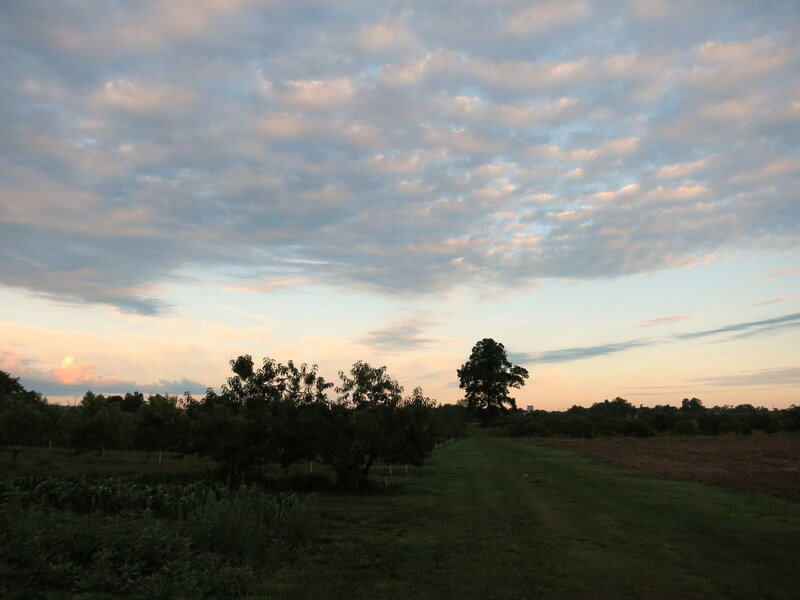 Already some trees are empty – their peaches all picked. They can rest. Their work is done for the year. Cucumbers appeared in last Friday’s box, unannounced. The extreme heat & humidity brought them on faster than expected. They will be in everyone’s box this week. We have green ones & white ones too. The white cucumbers are called Silver Slicer, known for their mild flavour, juicy texture & thin skin. 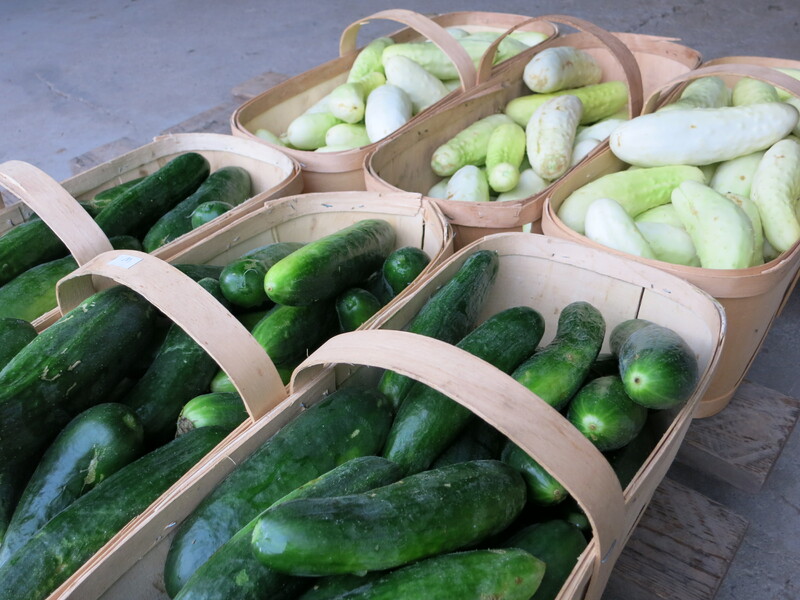 We like them because they are better to pick – white cucumbers are easier to see in the green leaves than the green ones. Salad turnips also showed up in your share last week. They are crunchy like a radish, but without the sharp flavour. Eat them raw as a snack or slice into salads or sandwiches. Along with the green beans this week we have more of the yellow beans with purple stripes called “dragon’s tongue”. We think they taste better but you can decide that for yourself. Let us know how you like them and we can grow more of them – or less – next year! Unfortunately they lose their purple stripes when cooked. 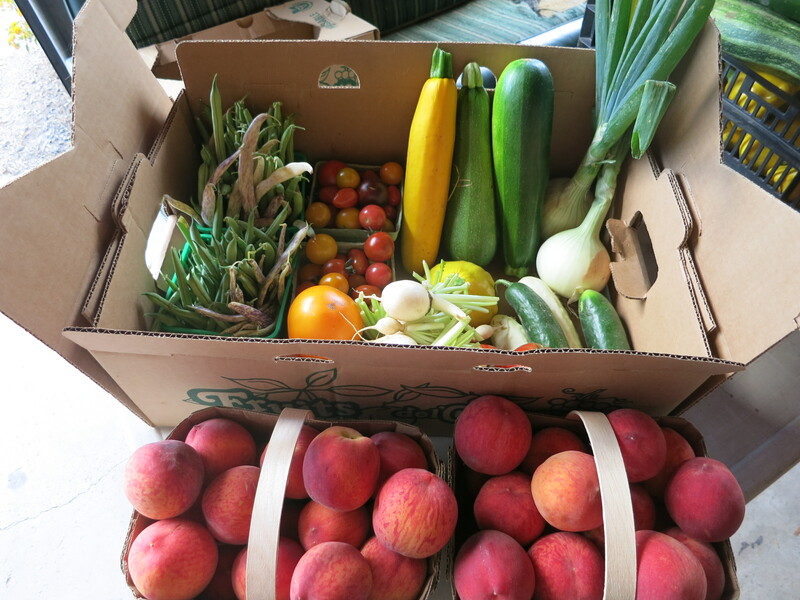 Tomatoes, onions, & zucchini are staples in the box this time of year. The tomatoes were especially happy for the bit of rain we received on the weekend. It perked the plants up & will hopefully speed up the ripening too. Our zucchini is somewhat of a disappointment this season – so many odd shapes & weird colours. While they might look strange, they still taste good though! … there may be other vegetables in your box again this week? Sometimes we don’t know what’s all there until we start picking on Tuesday morning. And by Friday other things may have ripened, or be finished. So … surprise! 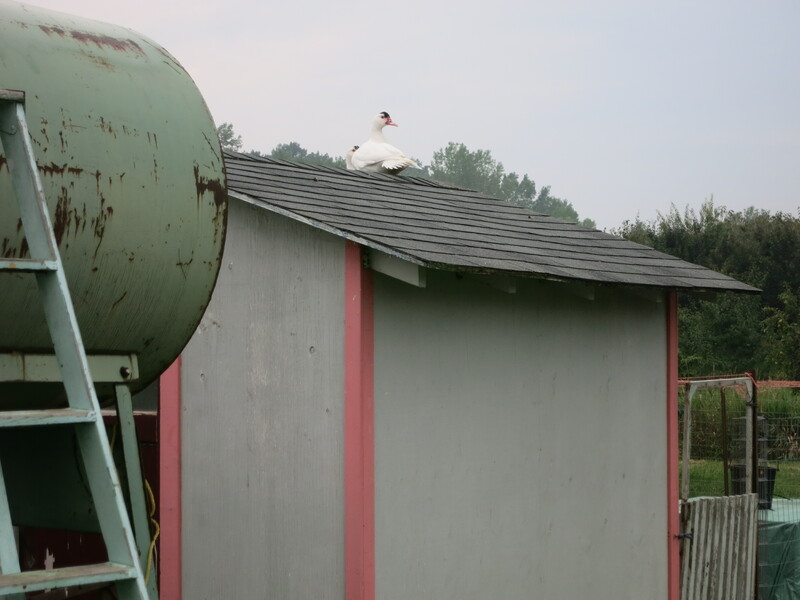 Fruit & vegetables are not the only things growing on the farm. 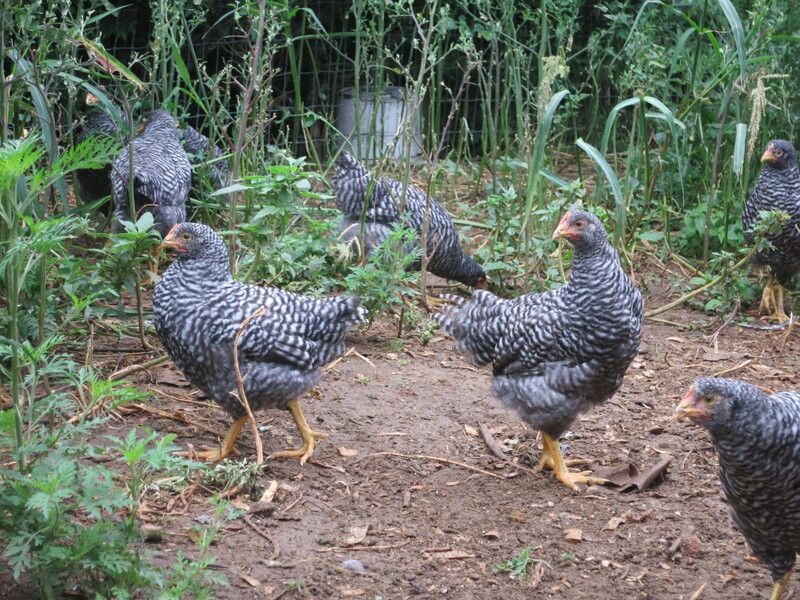 The chickens & ducks seem to be getting larger by the day!